The Big Money this afternoon came out with a devastating (and gutsy) article by former Fortune writer Roddy Boyd on the corporate crime petri dish that is Overstock.com, and its nuts CEO Patrick Byrne. The title is "America's Nastiest CEO," and it describes how Byrne has systematically harassed and attacked critics to cover up his own incompetence and wrongdoing--stuff that actually is a lot worse than has previously been acknowledged. What caught the attention of critics was its announcement in the first quarter 10-Q filing in May of 2005 that it had set up a “variable interest entity” to engage in these transactions. The entity had agreed to lend Overstock up to $10 million—$8.4 million of which had been extended in November 2004—for which it received a below-market interest rate of 3.75 percent and a 50 percent claim to all profits. Overstock also had an option to buy the 50 percent it did not own. Jeff Matthews, a hedge-fund manager, author, and blogger who had long been critical of Overstock and Byrne, immediately seized on the unusual structure of the transaction. He wondered why Byrne, who had discussed the great opportunities they were seeing (and participating in) within the diamond market that January, had not disclosed something as material as the joint venture.
. . . But the truth is much simpler: The deal seems to have been a tax dodge. The joint venture, struck with Moshe Krasnanski and his brother-in-law Mayer Gniwisch—a pair of veteran diamond merchants whom Byrne referred to as “Our Lubbavitcher friends”—had nothing to do with efforts to minimize accounting losses. In an e-mail to the board of directors, Byrne dubbed the process of recruiting the pair, who had set up the profitable online diamond-seller Ice.com, “Operation Heist and Freeze.” According to a memo, Overstock general counsel Jonathan Johnson prepared for the board of directors on July 13, 2005, the company’s VIE was designed to avoid a “nexus in the State of New York for sales tax purposes,” which means that the company would not have to collect, and pay out, sales taxes in the state. The diamond sales effort never really went anywhere for Overstock, and it was closed out during the holidays of 2006 with about $567,000 in accumulated losses, according to an internal balance sheet for the joint venture. I imagine this explains why Gniwisch appeared on a message board to rub lotion after Byrne spouted some choice anti-Semitic epithets, as he does when life is not going well. This is all horrific stuff, which brings me to the chart at the top of this item. 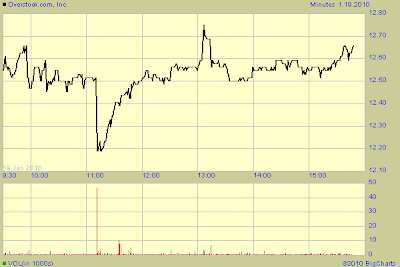 Today, somebody dumped a 50,000-share block of this thinly traded company, and other large blocks were also jettisoned. The article appeared after the trading day ended. I don't know if there's an insider trading issue, but I do know this--these trades may well have been prompted by Byrne revealing Roddy's impending article last Friday, in violation of Regulation FD, as in "fair disclosure." Today was the first trading day after the blog post appeared. 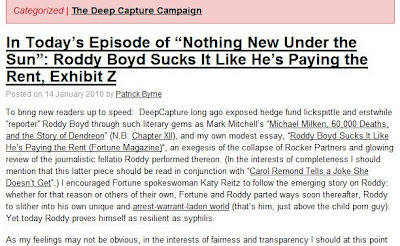 He did so by a tactic he has used several times in the past, publishing Roddy's questions in a typically juvenile obscenity-laced blog post (below) aimed at attempting to sabotage the article. He has done this kind of thing before. He tried it with Roddy once before, and at about the same time scared BusinessWeek to not run an article under preparation in early 2006 on Overstock's woes. The Big Money was made of sterner stuff. Not only did this abortive journalist-intimidation scheme backfire, but it put Byrne in violation of Reg. FD, by disclosing to a select audience the material fact that an incendiary, potentially market-moving story was about to come out. Regulation FD requires that investors receive material information from companies in a uniform, fair manner. Also last week, Overstock had to scramble to issue a form 8-K because of another FD violation, this one involving his blurting out to the New York Observer than the company was supposedly going to record a "profit" for last year. As I indicated at the time, Byrne simply does not like abiding by the securities laws. They're not included with his trust fund check, so as far as he's concerned they don't exist. The revelations in Roddy's article are all very serious stuff. New York state does not like schemes to avoid payment of state sales tax, particularly when the state is clutching after every penny. Carol Remond of Dow Jones News Service reported on Friday that the SEC has subpoenaed all discovery in the recent litigation involving Copper River partners (former Rocker Partners) and Overstock, which presumably includes all this sales-tax-dodging sleaze. All the king's horses and all the former SEC attorneys in his employ can't put the toothpaste back into this particular tube. It could mean the long-anticipated end to this dog's breakfast of a company and its stomach-turning chief executive officer. You have to admit, Overstock is dying as it has lived--right down in the sewer. But here's the ultimate irony: all the Ralph Kramden style schemes, all the tax avoidance and scumminess, haven't put a nickel in the pockets of Overstock's shareholders. Overstock has engaged in a variety of actions and inactions that are likely to subject it to various future civil, regulatory and tax proceedings in various courts. The heart of the article reflects a tax scam run by the firm to avoid paying New York State retail sales taxes. I would expect the New York and/or the SEC to use Boyd’s article as a road map for any prosecution. It is clear upon first reading this article that not only is this a disastrous retail operation, but it is run by a deeply disturbed individual who seems to have never tripped across “The Truth” even by accident.
. . . Here is a bit of irony: On paper, you might be led to think that Byrne is a bright guy — undergrad at Dartmouth, a Ph.D. in philosophy from Stanford, a Marshall scholar. It just goes to show you that having book smarts, being people savvy and possessing common sense can all be mutually exclusive. I'm reminded of a famous quote from "Mr. Dooley," Finley Peter Dunne: "You can lead a man up to the university, but you can't make him think." There's a good deal more in Barry's blog, including an insightful review of the activities of the "possible pederast" Judd Bagley, Byrne's nauseating cyberstalker. Personally I think that description is unfair--to pederasts. Tim Sykes weighs in, though not specifically on the foregoing: "some people truly don't deserve free speech, spreading lies and misinformation about short selling Prick Byrne should be a penny stock promoter, not a public CEO." If and when stock reaches its true value, with the hot air and fraud removed, Byrne is going to be a penny stock promoter whether he likes it or not.
. . . the article details that internal Overstock.com documents revealed that the company's "software system couldn’t track its inventory well, its accounting staff had trouble deciphering how much it owed and whom it had to pay." However, my examination of Overstock.com's SEC filings finds that CEO Patrick Byrne and CFO David Chidester both signed Sarbanes-Oxley certifications for financial reports claiming that the company had effective internal controls over financial reporting, while internal company documents obtained by The Big Money contradict their representations to investors. Having done battle with New York's sales tax auditors as the criminal CFO of Crazy Eddie, I learned the hard way that they are more tenacious than mob collectors in retrieving monies owed - no offense to the SEC, FBI, or IRS. Under New York law, company officers are not protected by the corporate veil and are personally liable for any sales tax deficiency. That's right, and it's true with corporate tax issues generally. Once I worked for a small Washington news service that sometimes didn't pay withholding taxes to the D.C. government. The head of the news service spent a few days in jail, corporate shell notwithstanding. Bagley, posting under a pseudonym, took exception to Barry calling him a "possible pederast," on the basis of Bagley's obsession with friending children on Facebook. Note the response: "Anyone who uses a false identity online and that starts friending children is definitely a fraud, factually a cyber-stalker, and possibly a pederast. Hence, 'possible pederast.'" Good point. His behavior speaks for itself. There is an old expression that begins, "if the shoe fits." And if Bagley would prefer not to be thought of as a possible pederast, why is he stalking children?